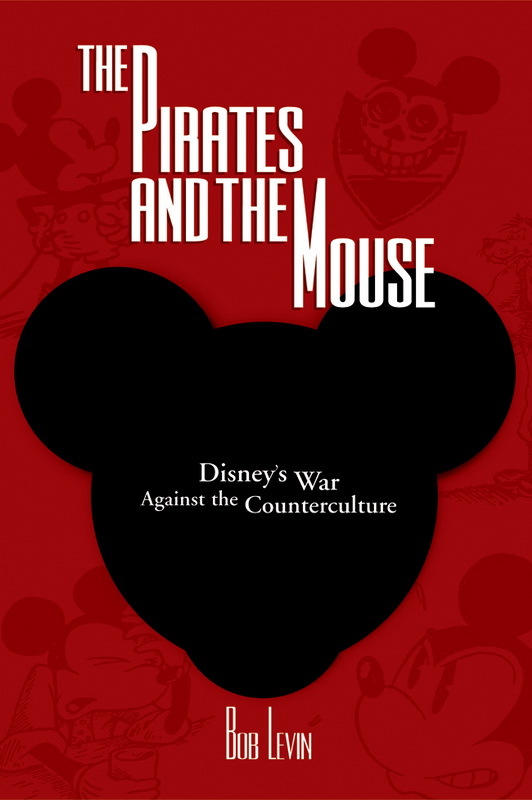 The Pirates And The Mouse: Disney’s War Against The Counterculture | The Bob Levin Dot Com. Underground cartoonists decide their contribution to the cultural revolution will be the destruction of Walt Disney. Drugs, x-rated comics and fair use. Pre-owned copies now available for $25, domestic-postage included. Signed. “Anyone with a serious interest in the history of underground comics is hereby directed to PICK THIS UP.” ARTHUR. “DEEPLY TROUBLING, SOMETIMES HILARIOUS, UTTERLY DEVESTATING… Communication classes should use this as a textbook.” BANDOPPLER MAGAZINE. “A GREAT STORY… If you have even an ounce of counter-culture revolution in your heart, how can you possibly resist this marvelous tale.” NETSURFER.COM. “A ‘MUST-READ’ for anyone concerned with such issues as artistic freedom, copyright law… and the darker side of corporate Disney.” MIDWEST BOOK REVIEW. “STARTLING AND EVOCATIVE… As a case study of modern copyright law and the conflict between free expression, intellectual property, corporate, cultural, and countercultural values, it is an invaluable primer and SHOULD BE PARKED IN A PLACE OF HONOR ON YOUR BOOKSHELF.” JOURNAL OF THE LAUREL HEIGHTS LITERARY SOCIETY. “If you’re into copyright law, UG history, perversion, comics, hippiness, art, seeing big old corporations getting pissed off in court, jokes about Irish temperment,and combinations of all these things, THIS IS A GREAT READ.” LIVEJOURNAL.COM. “ARRESTING… WRY… LUCID” (The Village Voice).